Fading beauty... Casino Notabile is being propped up with wooden planks to stop it from collapsing. Photo: Waylon Johnston. Casino Notabile is in imminent danger of collapse and one bad storm could sound its death knell, Rabat mayor Sandro Craus warned yesterday. The façade of the 19th century building is propped up by long wooden planks in a bid to hold up a substantial part of the structure and stop it from crumbling down Saqqajja Hill. According to historians, Casino Notabile was built by the nobles residing in Mdina as a place for their social gatherings. They had commissioned an English civil engineer, Paulson Webster, who had constructed the Royal Opera House in Valletta, to build a suitable edifice. It was completed in 1887. Speaking about the dire state of this historic gem, Mr Craus told The Times that it was high time the government woke up and took a serious look at the existing problem. 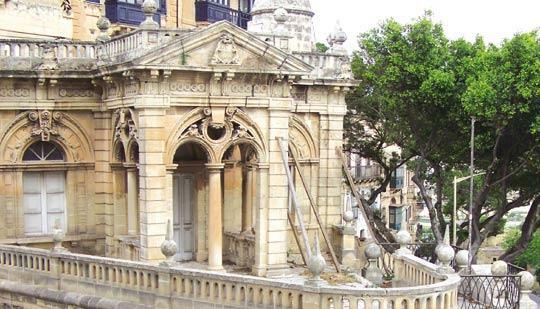 The deteriorating condition of Casino Notabile has concerned the Rabat council for a while and an architect it hired made a grim prognosis: if a bad storm hit Malta next winter, the structure would collapse. Situated alongside a busy thoroughfare, the building's condition also posed a serious safety threat to traffic and passers-by, including tourists, alike, he said. The building could serve as a tourist attraction, especially due to its strategic location. Instead, people were witnessing the pitiable state of a beautiful building propped up with planks and riddled with cracks. However, even though it stood at the entrance to both Rabat and Mdina and affected both localities, the Rabat council cannot do much about safeguarding the building's future because the structure is under the jurisdiction of the Mdina council, Mr Craus said. When contacted, Mdina mayor Peter Dei Conti Sant Manduca said he was unable to comment at the moment because negotiations were underway between the council and different ministries to have the building restored. Mr Sant Manduca added that the foundations of the building had been weakened because of the clay base, making the structure unstable. Mr Craus said he was prepared to cooperate with the Mdina council to resolve the problem. "However, we cannot do this alone. We need the help of the government. This is a large project that needs heavy financial backing," he said. "Being passionate about history and historical monuments, I would rather see the building collapse than have to watch it slowly degenerate in such a shocking way," he added. Unfortunately, there were no historic spotlights on the building to highlight its importance. Instead, the only things being brought to light were the cracks that were widening by the day. Mr Craus vented his frustration saying the government had hardly restored anything in Rabat. It was a pity that a locality with so many important national sites had received so little attention, he complained.